The bontebok (Damaliscus pygargus) is an antelope found in South Africa, Lesotho and Namibia. 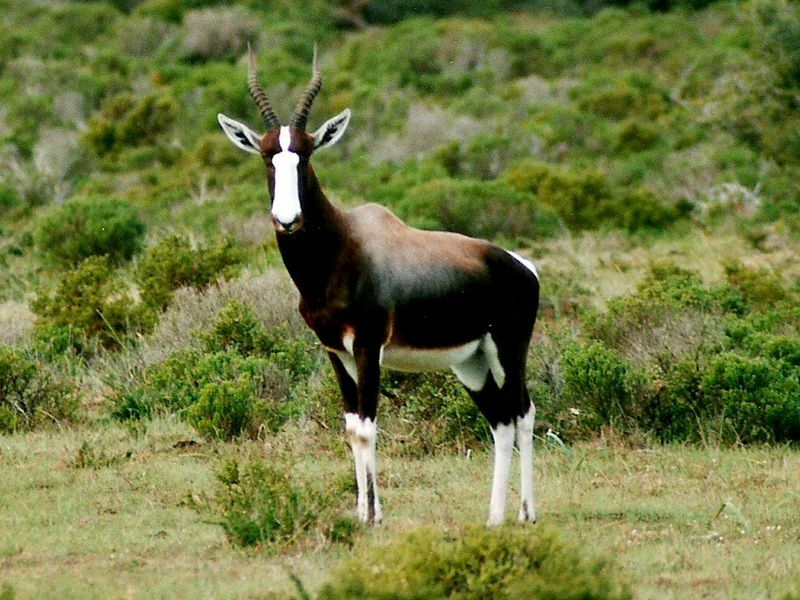 The bontebok has two subspecies; the bontebok (Damaliscus pygargus pygargus), occurring naturally in the Fynbos and Renosterveld areas of the Western Cape, and the blesbok (Damaliscus pygargus phillipsi) occurring in the highveld. The bontebok is a tall, medium-sized antelope. They typically stand 80 to 100 cm (31 to 39 in) high at the shoulder and measure 120 to 210 cm (47 to 83 in) along the head and body. The tail can range from 30 to 60 cm (12 to 24 in). Body mass can vary from 50 to 155 kg (110 to 342 lb). Males are slightly larger and noticeably heavier than females. The bontebok is a chocolate brown colour, with a white underside and a white stripe from the forehead to the tip of the nose, although there is a brown stripe across the white near the eyes in most blesbok. The bontebok also has a distinctive white patch around its tail (whence the Latin name), while this patch is light brown/tan in blesbok. The horns of bontebok are lyre-shaped and clearly ringed. They are found in both sexes and can reach a length of half a metre. Blesbok live in highveld, where they eat short grasses, while bontebok are restricted to coastal Fynbos and Renosterveld. They are diurnal, though they rest during the heat of the day. Herds contain only males, only females, or are mixed, and do not exceed 40 animals for bonteboks or 70 for blesboks. Bontebok are not good jumpers, but they are very good at crawling under things. Mature males form territories and face down other males in displays and occasionally combat. Bontebok were once extensively killed as pests, and were reduced to a wild population of just 17 animals, but the species has since recovered. Blesbok are extinct in their natural habitat, but they have increased in population to the point where they are now very abundant and avidly farmed, because they are popular quarry for hunters and are easy to sustain.